Music will be supplied by two Dj\'s who the description House Music legends was made for, Farley Jackmaster Funk and Seb Fontaine. When a new style of music first cracks the pop charts, the hit is usually a deliberate crossover by an artist having little to do with the music\'s original pioneers. His cover of Isaac Hayes\' \"Love Can\'t Turn Around\" made the Top Ten in mid-1986 - ironically, not in his home country but in the U.K.
- at the same time that he was one of the biggest names in Chicago house.He first made his name in 1981, broadcasting on Chicago\'s WBMX-FM with Ralphi \"The Razz\" Rosario, Kenny \"Jammin\" Jason, Mickey \"Mixin\" Oliver and Scott \"Smokin\" Sils as the Hot Mix 5 - the legendary DJ team which broke house music for a wider Chicago audience. 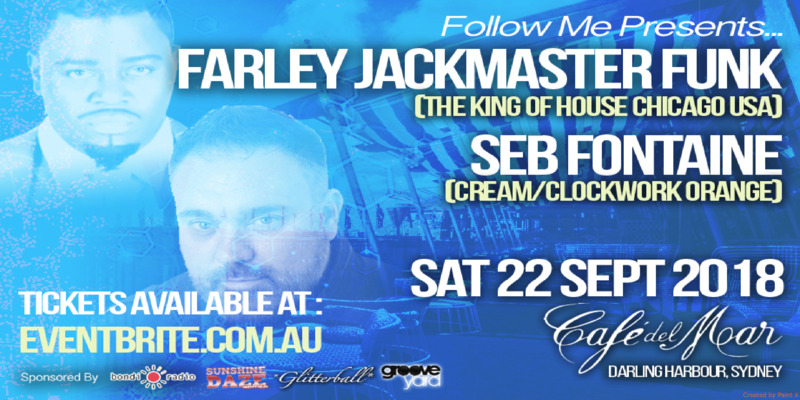 Farley also appeared at the legendary Warehouse club mixing alongside Frankie Knuckles.Known as Farley Keith or Farley Funkin\' Keith up to that point, he began recording in 1984 with the single \"Jack the Bass,\" which inaugurated the highly popular jacking craze in Chicago house. After two more singles (\"Funkin\' with Drums Again,\" \"Give Yourself to Me\") for Trax Records, he re-christened himself Farley Jackmaster Funk and released \"Love Can\'t Turn Around,\"
He also recorded new material on Terry Hunter label T\'s Box, \"I Am A House Head\" which gained international exposure last summer and was a new house phrase used throughout the digital promotional world. With these high profile residencies came the opportunity to work with KISS FM and later Radio One â\" where he presented a weekly Saturday night show to a worldwide audience. As an elite international DJ, Seb has also released a number of best-selling compilation albums for Global Underground (âPrototype\'), Ministry Of Sound, Cream and Positiva. Last year he hit #1 again on the Cool Cuts and Buzz Chart with âNeed to Feel Loved\' as Reflekt. Originally released on Postiva in 2004 and produced by Seb Fontaine and Julian Peake, âNeed To Feel Love\' was a massive international success. Seb Fontaine has been at the pinnacle the dance scene for over 20 years and maintains his status as one of the world\'s best DJs.